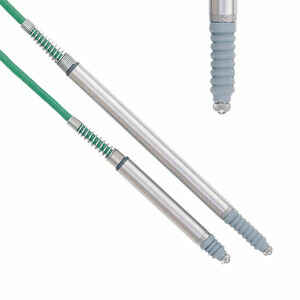 OMEGA's GP901 series digital gaging probes are a refinement of the LVDT, making use of a proven mechanical design and robust construction. In a digital gage probe, the coil forms part of a frequency-sensitive circuit. As the core moves, the inductance of the coil changes, causing a change in the frequency. By comparing frequencies, the user can determine the movement of the core. Each digital probe is calibrated on a laser interferometer in a controlled environment, giving improved linearity over the full stroke compared with LVDTs. Signal conditioning and an A/D converter are contained in an in-line probe electronics assembly. The electronics assembly provides a digital signal which is compatible with the DR601 display or the LDN232 RS-232 adaptor (see Related Products below). 참고: For compatible instruments please refer to the following models: DR601 and LDN232.